Marley Lilly Monogrammed Clutch Giveaway! Sperry Top-Sider Winner plus coupon code! Shabby Apple winner and DISCOUNT code!!! I keep my favorite bracelets in a heart shaped box. A few years ago I received some Juicy Couture underwear in this adorable box. It has dividers (for each pair of underwear that came with it) so it is perfect for storing bracelets! I love how you organized everything! So so cute, and I especially lover the pottery barn nacklace holder, that looks great!!! I am also a huge fan of that perfume!! 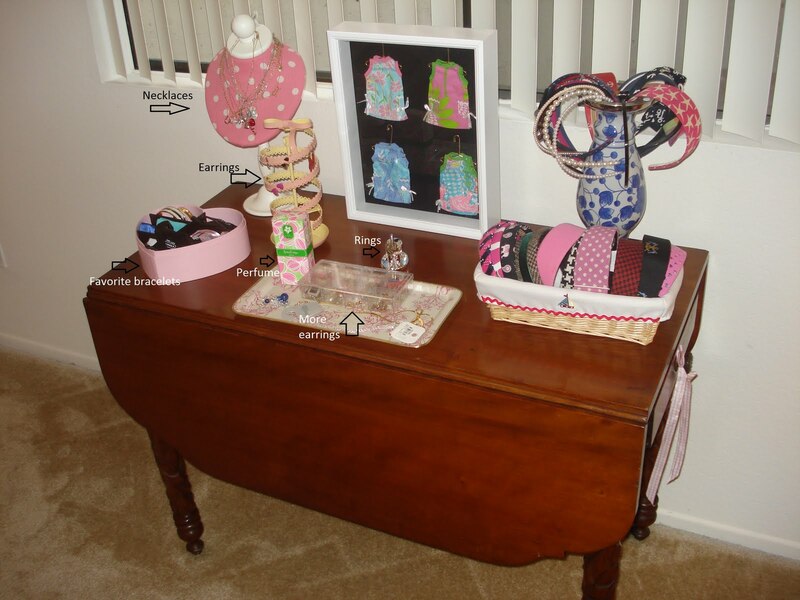 Love your organization, and your accessories are sooooo cute! Great taste. Adorable! I love having everything organized and the way you did it is cute and functional! thats a great idea for your headbands! Cute AND organized! The very best combo! Wow, very cute how you organized it all! I love your headbands and Lilly shadow box. I just love displayin' and changin' girly things in the bedroom and bath! How very fun! Loving the framed ornaments...what a great idea! I'm also on the hunt for a table exactly like that for my formal living room! I pretty much want everything in those pictures. The headbands alone have me swooning! I love the framed mini shifts! The whole set up is fabulous! I have that ring holder! Or, at least I did. LOL!